Interior Features Prime Wilshire Corridor View Condominium at "The Park Wilshire" located on the 14th Floor. 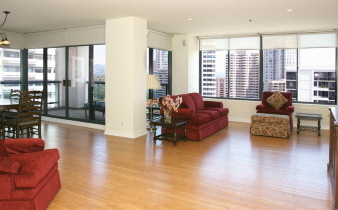 Spacious, 2 Bedroom, 2.5 Bath beautifully located and appointed condominium home. City and Mountain Views from every window. Luxurious Master Suite with private bath featuring a Spa Tub, Private Commode and Large Stall Shower, Double Sinks. Second Bedroom Suite with custom built-in. Formal Dining Room, Breakfast Room, "Cook's" Kitchen, Private Balcony Retreat, Laundry Room. The Park Wilshire offers all residents "5 Star Hotel" Quality Features which includes 24 Hour Security, Valet Services, Private Swimming Pool and Spa, Large and Lovely Exercise Room and Equipment. Beautifully decorated Guest Retreats and Entertainment Rooms off of the Stunning and Gracious Lobby. This home will be leased partially furnished or unfurnished. Exterior Features Beautifully Appointed Building Structure. Pool and Spa. Quality Lounges and Tables for comfortable poolside visits. Additional Features and Amenities Full Service Condominum Living.